I won’t ever wilfully miss an opportunity to see an Arthur Miller play. I love his work and want to see it done well, I don’t think that’s a big ask. 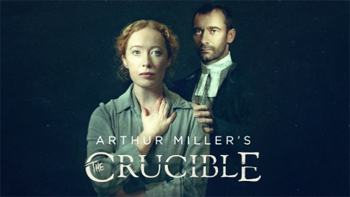 Taking the opportunity to see the Crucible at the Manchester Opera House, I went along with not unreasonable expectations of seeing a fantastic show. Read on to be the judge of whether or not I thought Sell A Door Productions staging of Arthur Miller’s most celebrated play met such expectations. If one is going to say anything about Miller’s writing the first thing you can say is that it is undeniably rich in social and political commentary. One look at a script or character and the story tells itself. It’s almost impossible to get wrong when his writing makes it so easy for us. Unfortunately, in this production a cast of seemingly decent actors have somehow managed to bypass such a solid base that the text offers to deliver poor performances from all. I’ll quantify this by stating that there appeared to be little understanding of the nuances of the script. When Abigail Williams is left alone with John Procter it should be obvious to the world that she is trying to seduce him. Unfortunately, after however many weeks of rehearsal this should at some point have become clear to the poor buggers playing the roles. Instead it becomes less of a power battle with John Procter resisting Abigail Williams's amorous advances and more of a boring slanging match, the likes of which should be more likely to be found on an amateur stage than on the stage one of Manchester’s biggest Theatres. This example was perhaps the most telling but the lack of understanding of the text is a constant and disappointing occurrence throughout the play and cannot be covered up by any amount of interesting silhouette lighting work which happens randomly during the middle part of the play only. That, as a singular idea, is a nice one but doesn’t fit well within a production with no textual cohesion. This lack of even basic understanding of the text is by far the biggest problem I have with this production. There is no attempt to cut into the potential for the exploitation and manipulation of peoples fears as Miller intended. It’s intellectually sloppy. Added to this, the scene transitions are chaotic with a mass of bodies rushing around in darkness and taking their merry time about shifting a few items of set. I was sat there wondering if I should have brought an hourglass with me to measure the length of eternity of these scene changes. This was nothing though compared to the most unusual way in which new characters were introduced. Strange sound and lighting cues to mark a new character standing at the door called to mind more melodrama than American social realism. There are a lot of questions that I want answers to regarding this production. Mainly they revolve around the artistic choices. Usually these choices become clear from seeing the play but in this production we see a poor realisation of an artistic vision which is never fully apparent, which is a crying shame. I love the work of Arthur Miller but by the interval I wished to return to the cocktail bar from whence we came.